1. Belt your best Beyoncé impression behind a stenciled-lyric shower curtain. Learn how to get the look here. 2. Make cold tile floors 110% cozier with a pom-pom rug DIY. Make mornings a heck of a lot easier. And all you need is yarn and a non-stick mat. 3. Pour your hair potions into uniform bottles for ultimate zen. Use recycled Frappuccino bottles. No more bulky plastic bottles! 4. 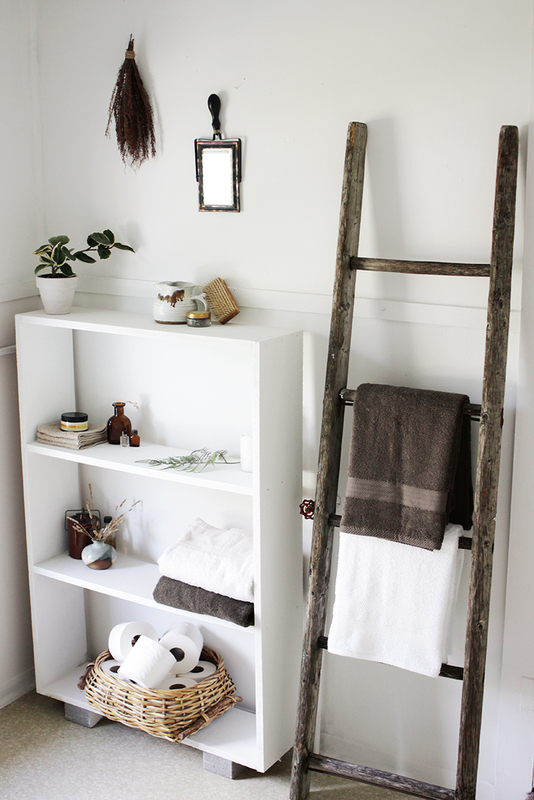 Make this schmancy-looking bathroom organizer with things from the dollar store. Learn how to re-create the look for around $5 at This Casita. 5. This Ikea hack mirror will class up any powder room. 6. Use a curved shower rod for a bigger-feeling shower. Showers are infinitely more luxurious when you can actually stretch out a bit. And you can get one for as low as $18. 7. And use two shower curtains for a grander tub. Shower curtain panels make for a far more luxurious bath experience. For a tiny bathroom, just cut the curtain in half and hem the edges. Easy peasy. 8. 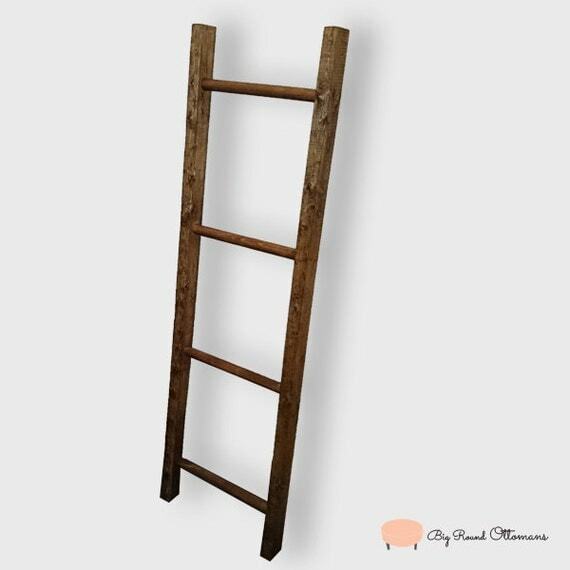 Hang towels on a decorative ladder for a rustic storage option. Bonus points for not having to drill any more holes in the walls. You can find them onEtsy for as cheap as $24. 9. Hack your shower storage by adding a second curtain rod. Plus, hanging things will dry off better. Find our more here. 10. Get the spa experience with a DIY pebble bathmat. All you need is an outdoor rubber mat (with holes for drainage), some waterproof sealer, and smooth stones. 11. Put your mouthwash in a cut crystal decanter. You can find ones like this for under $15. 12. Make a cheap and easy bathtub tray for wine + book baths. Get the great how-to here. 13. Turn a cheap dresser from a flea market into a furniture vanity. 14. Give a standard bathroom mirror a makeover with a brightly colored frame. 15. Move the shower caddies under the sink for storage that will actually stay de-cluttered. Check out this great idea here. 16. For a tiny bathroom, combine wall decorations with storage by making pretty copper makeup cups. 17. Make your bathroom ~extra private~ by frosting windows using contact paper. Without the bulk of curtains! Bonus points for lots of natural light. 18. Keep curling irons stowed neatly in mounted PVC pipe. 19. 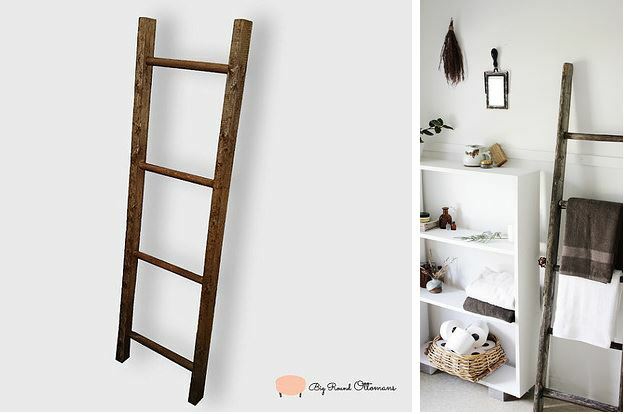 Add some rustic charm with a DIY pallet shelf. 20. Get the look of granite without tearing out your bathroom — with just a coat of paint. 21. Turn a reclaimed window into a medicine cabinet. Pretty and functional. Learn how here. 22. Forget your forgetful mornings with a DIY vanity whiteboard. Glass frame + white paper + stencil. 23. Mount fun Target antlers on the wall as a cooler alternative to a boring towel hook. Check out the great idea here. 24. Make this DIY glass top vanity to actually see all the cosmetics you own. #Genius. Check it out here. 25. Craft geometric mirrored accents to decorate small bathroom wall areas. Mirror decorations are perfect to make small bathrooms seem bigger. This awesome DIY requires only cardboard shapes and mirror sheeting. Amazing. 26. Give cheap thrifted or dollar store-glass trinkets a milky antique finish. Pretty for flower displays or just holding all your junk. Find out how here. 27. Transform storage with a pop of color on shelf fronts. And nail-on leather labels for professional-level organization. 28. Add some plant greenery for ~freshness~. While purifying the bathroom air. Make sure to pick plants that suit the bathroom environment — preferably ones that require less natural light and a more humid environment. 29. Keep guests from tripping in the middle of the night with this unique twinkle-light DIY. You can spell out any word or shape you like. 30. Maximize storage for your prettiest toiletries with interesting shelves. Check out this tutorial to DIY your own. 31. And make visits to the bathroom way more fun with a dino toilet paper holder.